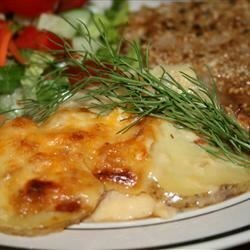 "Delectable creamy Au Gratin Potatoes are enhanced with subtle flavors of fennel and bacon. Caution: this recipe will make people break your door down for some more. I never measure unless baking, always use eyeball judgement, so feel free to adjust to your personal feel and taste. To create a more crispy top, sprinkle some Parmesan cheese and bread crumbs over the top when there is about 15 minutes left to cook. " Preheat the oven to 325 degrees F (165 degrees C). Fry bacon in a large skillet until browned. Drain on paper towels. Chop or crumble, and set aside. Melt the butter in a saucepan over medium heat. Whisk in the flour until smooth and starting to bubble. Gradually whisk in milk while stirring constantly so that no lumps form. Cook and stir over medium heat until thickened, about 5 minutes. Season with white pepper, salt, pepper and nutmeg. Remove from the heat and stir in the cheese until smooth, adding a handful at a time. Set aside. Use 1/3 of the potatoes to make a layer in the bottom of a greased 9x13 inch baking dish. Top with 1/3 of the fennel, 1/3 of the bacon and 1/3 of the basil. Pour about 1/3 of the cheese sauce over everything. Repeat layers two more times or until you run out of room. Cover the dish with a lid or aluminum foil. Bake in the preheated oven for 1 1/2 hours. Remove the cover during the last 30 minutes to allow the top to brown if desired. Learn how to make this creamy, cheesy casserole—a favorite all year long. OMG how could something NOT be good with bacon in it? I didn't use fennel or basil because I didn't have any, but did use flat-leaf parsley. This is sooo easy to make and is well worth the cooking time. My family love it. Last time I omitted the bacon and used Mexican cheese. It was still delicious.